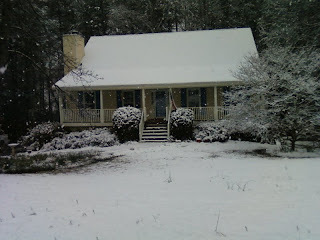 Caitlin's Blog: Let it Snow! Let it Snow! Let it Snow! When I lived in Utah, snow was part of life in the winter. Back here in the south, snow is rare! So when it snowed a few weeks ago, I just had to take pictures. I took this picture with my phone as my mom and I were getting home from church. My car hadn't seen this much snow since leaving Utah! I thought this tree in the front yard looked ever so pretty all covered in snow.